1. Are the Laurel & Hardy films available on DVD? 2. What is available in America? 3. How do I become a Sons of the Desert (= Laurel & Hardy fan club) member? 4. How can I start a Sons of the Desert tent in my area? 5. I would like to read more about Laurel & Hardy. Can you recommend a book? 6. Who can I contact regarding license inquiries for Laurel & Hardy films, clips or photos? There's also a 21 DVD box by Universal called the "Laurel and Hardy Collection". It contains nearly all of the Laurel & Hardy features, talkie shorts and silent shorts, produced by Hal Roach. The Universal sets are available at Amazon UK or JB Hi-Fi in Australia. The Laurel & Hardy films, produced by Hal Roach, are available in a boxed set called “Collection Grands Classiques - Laurel et Hardy - Coffret 12 DVD”, released by Universal, region 2, PAL. The Laurel & Hardy films, produced by Hal Roach, are available in a five disc boxed set called “Stanlio & Ollio Collection”, released by Universal, region 2, PAL. The Laurel & Hardy films, produced by Hal Roach, are available in a boxed set called “Laurel & Hardy: Edición Coleccionista 5 Discos”, released by Universal, region 2, PAL. The Laurel & Hardy films, produced by Hal Roach, are available in a five disc boxed set called “Laurel & Hardy Collection”, released by Universal, region 2, PAL; language: English, subtitles: Swedish, Danish, Norwegian, Finnish. 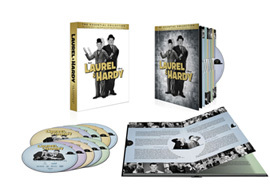 LAUREL & HARDY: THE ESSENTIAL COLLECTION debuts in a stunning 10-disc set on October 25, 2011 from RHI Entertainment and Vivendi Entertainment. With a comedic style that defined an era and created a legacy that is still celebrated today, 58 of Stan Laurel and Oliver Hardy’s talking shorts and feature films, produced under legendary movie mogul Hal Roach from 1929 through 1940, are now available for the first time in the U.S. all together in one magnificent collection. There is a list of “tents” in the Sons of the Desert section of our website. In the Eastern Hemisphere (i.e. the world minus North, Central and South America) use the business contact forms on this website for all license inquiries regarding Laurel & Hardy films produced by Hal Roach.